I got the 14k Gold Coin as a wedding gift from a friend. I loved that coin immediately. Later on I bought the remaining silver coins in this collection from the Royal Canadian Mint. I must say the quality of the images below is not really good. The real coins are impeccably beautiful. On the antique celluloid, the light flickers. Sled dogs move silently across the Arctic tundra. A man perched on an ice floe surveys the horizon as teams of men and dogs prepare for ice-bound travel behind him. In the distance snow-capped mountains rise into the sky like jagged shards of ice. In grainy photos, men stand alongside makeshift fences, before shelters made of skins and furs, in open ice fields, atop sleds packed with gear. Some smile; others stare silently into the lens, arms crossed, thoughts unfathomable. These are only a few of the approximately 4,000 photographs and more than 2,700 metres of film capturing one of the twentieth century’s most exciting moments in exploration: the Canadian Arctic Expedition. In 1913, Canadian Prime Minister Sir Robert Borden commissioned an expedition, led by Manitoba-born ethnologist Vilhjalmur Stefansson, to explore and map the western Canadian Arctic. Stefansson and zoologist Rudolph Anderson had travelled through the Far North the previous decade. Knowing that there was a great deal of unexplored potential in the region, Stefansson planned to continue his earlier journey, but the Government of Canada, recognizing the importance of new sovereign territory, hosted the Expedition and broadened its mission significantly. A Northern Party led by Stefansson would undertake the mapping exercise while a Southern Party led by Anderson would explorer the geology, resources, and native inhabitants of the northern mainland. Traveling by sea and despite significant hardships, the Northern Party covered thousands of kilometres, mapping land that even the local inhabitants had never seen. The Northern Party discovered four new islands and proved that some of the geography proposed by nineteenth century expeditions was erroneous. The Southern Party completed the full mapping of the mainland and produced 14 volumes of scientific data as well as thousands of specimens and artefacts, opening up a new world of wonder for Canadians. Their findings included information about flora and fauna never before recorded, fossil samples, and more. Their cultural research familiarized the world for the first time with the culture and way of life of the Copper Inuit and the aboriginal peoples of the Northwest Territories, Yukon Territory, Alaska and Siberia. From these Aboriginal peoples – some of whom participated in the Expedition as guides and other assistants- they collected artistic artefacts, tools, knowledge, and thousands of photographs as well as extensive film footage. The Expedition’s artefacts, photos, and recordings enabled researchers to introduce to the rest of the world cultures that had been virtually inaccessible until that time. The artefacts have also had a broad educational legacy, forming the basis of numerous educational programs and museum exhibits, and are an important pillar of the permanent National collections of the Canadian Museum of Nature and the Canadian Museum of Civilization. This 100-dollar coin is certified to be 14-karat gold with a metal content of 12 grams and a diameter of 27 millimetres. In this design, Canadian artist Bonnie Ross depicts several key images representative of the Canadian Arctic Expedition, including a survey team atop an ice floe taking research measurements and, in the background a stylized map of the Canadian Arctic. The obverse features the effigy of Her Majesty Queen Elizabeth II by Susanna Blunt. Both the brilliant uncirculated silver dollar and the proof silver dollar in this collection are certified to be 99.99% pure silver with a diameter of 36.07 millimetres and a weight of 23.17 grams. Designated by Canadian artist Bonnie Ross, the reverse image draws on photography from the Canadian Arctic Expedition, depicting a group of three men aboard a dogsled, the waiting dog team before them listening for the command to move across the Arctic tundra. The skyline and horizon behind this portrait are filled with a stylized image of a compass. The obverse features the effigy of Her Majesty Queen Elizabeth II by Susana Blunt. 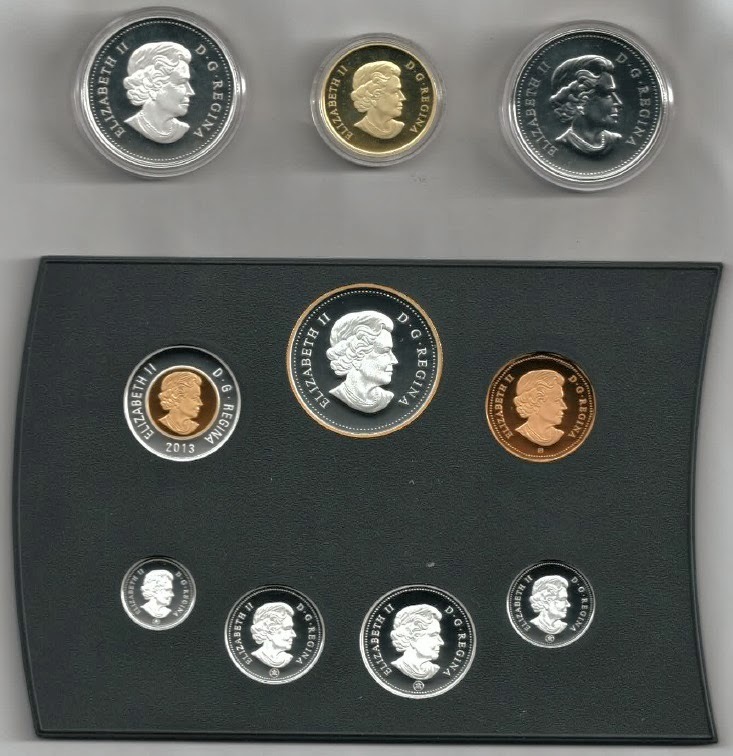 This is the 2013 fine silver proof set of Canadian coinage. 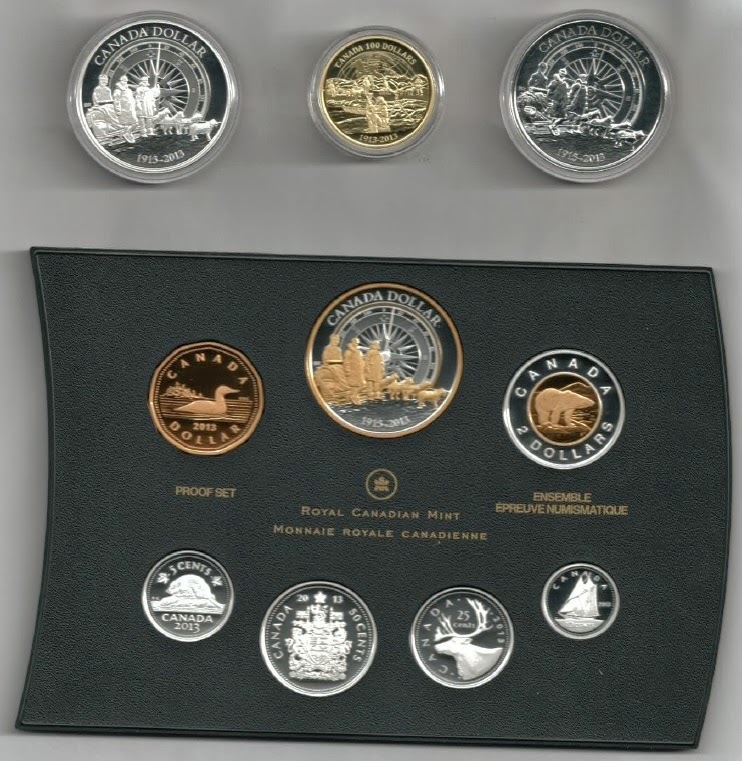 This is the only set that features the commemorative silver dollar selectively gold-plated and the gold-plated one-dollar coin depicting the common loon. 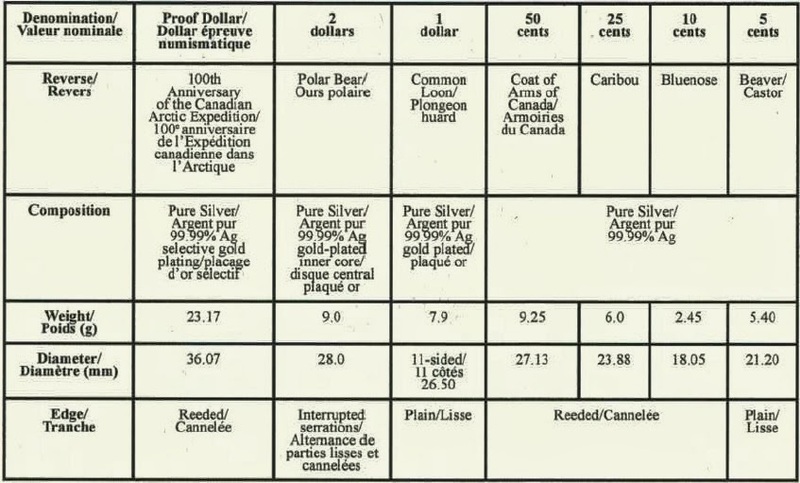 The chart below shows the characteristics of each coin in the 2013 Fine Silver Proof Set of Canadian Coinage.